As an education advocate, I decided to dedicate part of my life to teaching. This also has led me to doing lectures at art schools, universities, arts organizations and museums. I'd love to come visit and meet the students at your school! I spoke to students in Brian Rea and Paul Roger’s class at Art Center. I will be speaking to students of Leeds University of Art. It'll be an interesting trip as I intend on bringing my students to Leeds to work with students there in 2019. More information on this talk soon. 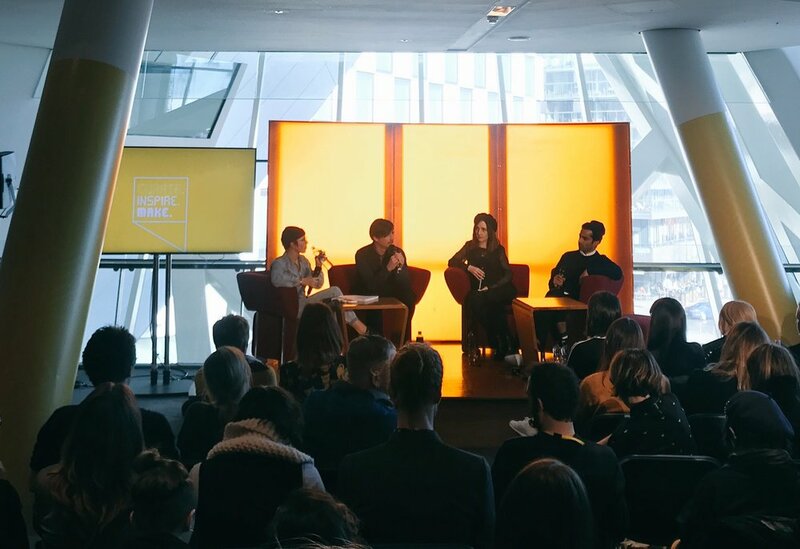 In front of 200-300 people, I was part of a panel discussion at the OFFSET conference in Dublin. Insights Into The Business Of Being A Professional Illustrator With Scott Bakal, Claudine O’Sullivan & Karan Singh. It was a quick 50 minutes but I had a wonderful time meeting illustrators from around the world. Being awake nearly 24 hours and only having a few hours after getting off the plane in Ireland by the time I started this lecture, while a bit hazy, I had a great time with the students at D.I.T. The space I did the lecture in was amazing as well being in an old chapel. I did my usual student lecture with a brief Q&A and looked at a few Senior portfolios. I did lectures for two classes at FIT over two days. First was a Book Illustration class for illustrator Eric Velasquez and the following day was a Drawing for Illustrators class for artist James Hoston. I used to teach courses at FIT for five years up until I moved to Massachusetts so it was sort of a homecoming and a reminder of how much of a good time I had teaching there with so many wonderful people. I had a morning visit with a Freshman Illustration class in New Hampshire. The professor, Dom Civiello was a former student of mine and I couldn't be more proud of him and what he's accomplished. I love that he's paying it forward to his own students. It was a good class filled with delightful people. I look forward to seeing what they do in the future. I started a full day working with Portfolio students discussing their work with them. I then did a presentation of my work. The students I met at RISD are charming and talented. I had some great conversations and enjoyed meeting so many new people. I look forward to seeing all of them find success as artists out in the world. I visited the Maine College of Art not to do a lecture this time, but I was invited to review the illustration program. It is a small but incredibly vibrant school. The students are quite dedicated and I loved seeing their work. I visited Syracuse again! The last time I was up there was 2006 when I received my Master of Arts in Illustration Degree. I then went to Hartford University to get the terminal Master of Fine Arts. It's hard to imagine its been 10 years since I've been up there. I was up in Syracuse for two days and did two painting demos and had general conversations with the students about work life, business and anything else that was on our minds. Then, I did a presentation of my work to the illustration department. Open to the public. I had a blast talking with Irish students. I was invited to be part of a panel discussion about navigating your life as a creative. A wonderful event where I got to meet new friends and catch up with old ones. Poster announcing the exhibition and lecture. During my demonstration session, I was showing students my sketchbooks and discussing how my 'playtime' in them helps direct the work I do for clients. Students passing around my sketchbooks and original paintings during the demo part of my day at Lyndon. I had a Skype lecture with the Seniors through Jacqueline Decker about business practices and other related subjects. Technology is wonderful and connects people but I sure would rather be there in person. The illustration program is small but it has an incredibly active Illustration Club which has brought up many illustrators and artists to speak to them. I had taught an illustration class there for a semester or two about 10 years ago so it was an honor to come back and help support the students. Here's a quick shot of some of the students. I showered them with gifts of the Skulls of Ultimate Death zine. A very humbling experience. As it turns out, the students select who they would like to come visit and for this particular semester, they picked me! It was an incredibly loaded day. 1. I gave an assignment to the entire Illustration Department and a week prior to my arrival, I had to select the top 25 ideas then the top 3 winners who get a free dinner out with the faculty and myself. Of course, I had to present all of the 25 chosen pieces and let them know why I chose them. No pressure! 2. A full lecture of my work and process. 3. A Seniors-Only sit down with them to discuss business-related issues and simply, what it takes to be an illustrator. It was an incredible joy to meet many of the students and faculty with a very young program but they are taking the illustration education by storm - lots of award winning students already! A quick snapshot a few minutes before I got started. What can I say? It's Ringling! I judged the Best of Illustration and did a lecture for the Illustration Department. Many great folks and students with whom I still speak to today. Great artists and fun school. Actually, this trip prompted a beach vacation in Sarasota of a few months later! Peace, quiet and beach.